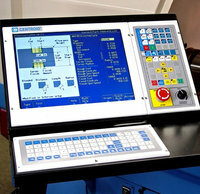 Centroid G10 G code allows cnc machinist to set parameters for different program operations. Many machine parameters can also be set with the Centroid G10 G-code. G10 H5 R-1.3 ; Sets tool length offset #5 to -1.3 in the offset lib. G10 D3 R.25 ; Sets tool diameter offset #3 to .25 in the offset lib. G10 D5 R.5 ; sets tool diameter #5 to 0.5” in the offset library. G10 P83 R.05   ; set clearance to .05"
G73 is the peck drilling cycle. The hole is drilled in a series of moves: down a distance Q at a given feedrate, up the retract distance at the rapid rate, and then down again at the given feedrate. The retract amount is set with G10 as shown in the example below.